TheInsaneDomain.com - Sorry to an annoucement. Where I work, we are mailed cheques and sometimes even cash in envelopes. To obscure that they have put such items in an envelope to discourage theft they put a scrap piece of paper around the cash/cheque. This is one of the scraps that I recieved the other day. 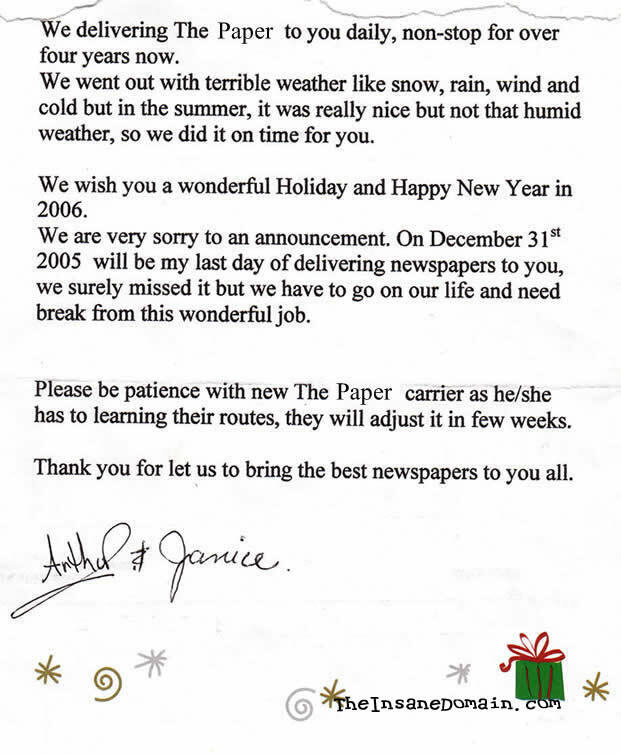 Their real names have been removed of course, and the real name of the newspaper changed to The Paper. While you might think it's cruel to laugh at this, I'm NOT laughing directly at the people who wrote this and whatever issues they have that caused this, I'm laughing at how the letter reads, so shut the hell up. As you read this, don't let your mind automatically correct it.